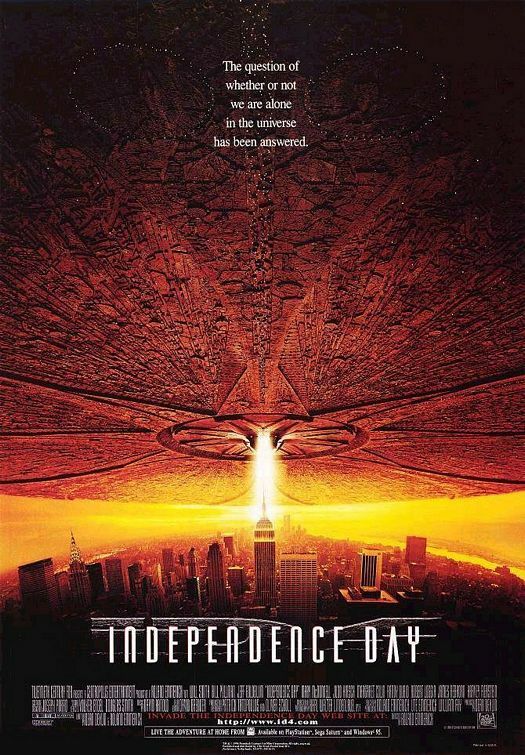 Home > Reviews	> Independence Day Review: … “Independence Day” of course! 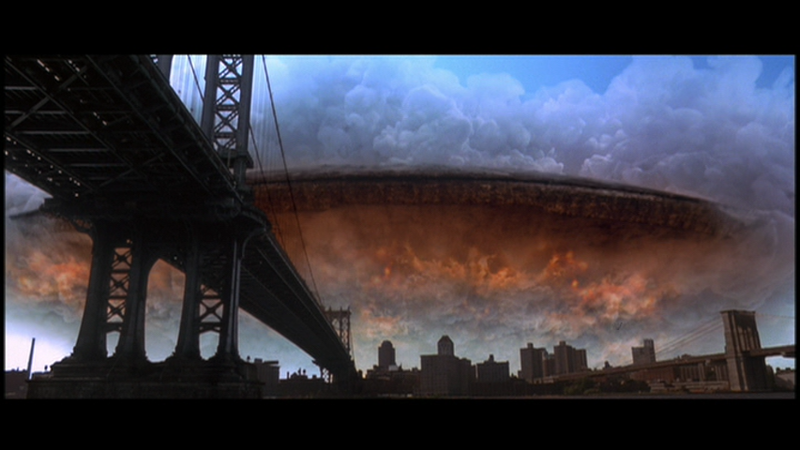 Independence Day Review: … “Independence Day” of course! 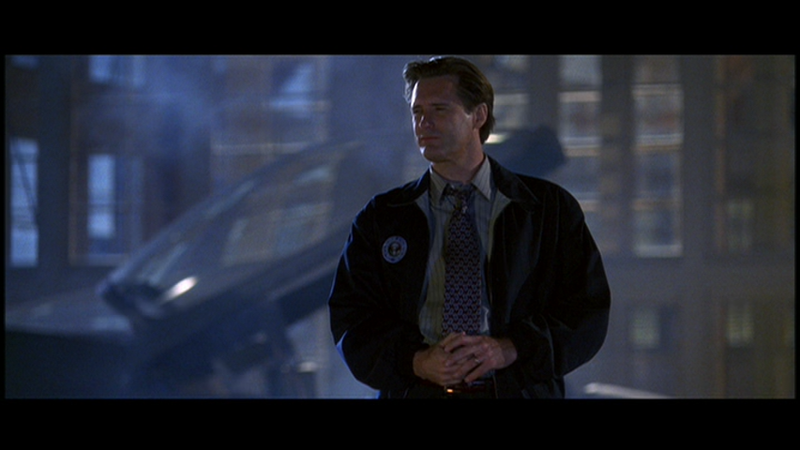 The concept of a self-aware film has already become a familiar trope, but Independence Day acknowledges its nature as a big budget B-movie while never truly drawing attention to the fact. It’s all played straight, and yet it’s still hilariously playful, just the same. Here’s a film where you really have to turn off your brain and not really think too much about the action, lest you be driven into madness trying to nitpick all the little details of the plot and pinpoint all the ridiculous things that the characters within are saying and doing. Once you do that, you’ll likely find yourself enjoying it far more than the film probably deserves. Unlike with director Roland Emmerich’s later and much more disastrous disaster movie, The Day After Tomorrow — a film in which you’re expected to suspend disbelief to the point where you have to accept that characters can outrun a temperature and also travel eastward from Pennsylvania and arrive in New York City from the freaking Atlantic Ocean — Independence Day just asks us to accept a few more reasonably trivial things, such as some widely debunked conspiracy theories or that a mother would endanger her child by calling out to and waiting for their dog to come as a wall of fire approaches them (because while they can’t kill the dog, they will the countless people running frantically with their families in the background). 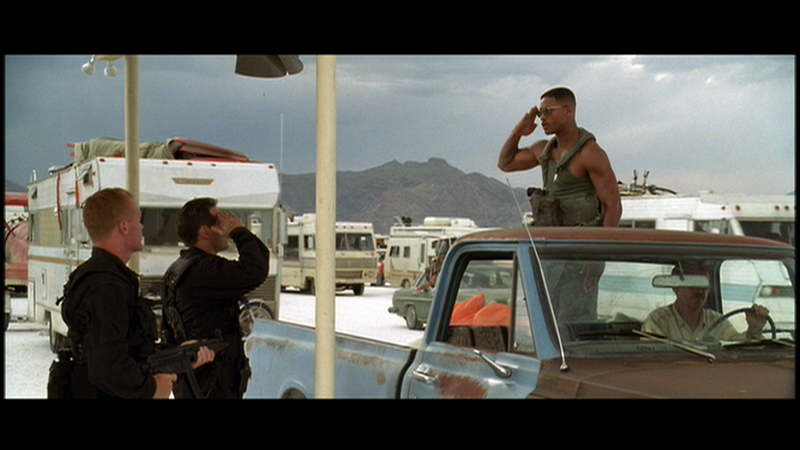 Once you’re able to do that, you’re liable to find that Independence Day just might be the greatest “bad” movie ever. Roland Emmerich has become synonymous over the years with big budget drivel like 2012 and the aforementioned Day After Tomorrow, but before then, he released two of his best and most influential works: Stargate and then this film. While by no means works of high art, with those two films he was luckily able to stave off his own infamy as a director for a while longer and deliver audiences some satisfying stuff, with Independence Day arguably being the better of the two films, ultimately even becoming up the first film I can remember going to see more than once in the theatres. Here’s a film where the digital and the practical effects are blended together relatively seamlessly for its time to create a satisfying series of explosions and the destruction of famous monuments along with their surrounding cities and the people who live in them. It’s not all action. There are romantic subplots, too! 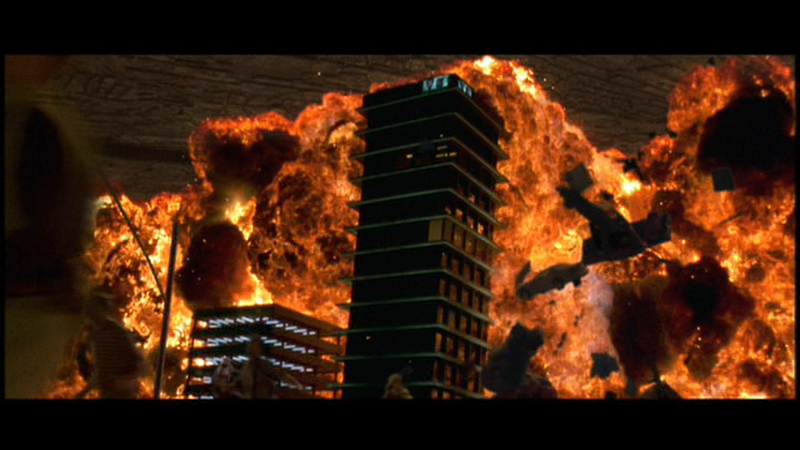 It’s actually so satisfying, even with all the advances we’ve made in the past 16 years, that it’s only a shame we never get to see the destruction of some of the non-U.S. locations that we’e told are also being overshadowed by their own giant alien space craft. With a title like Independence Day and a story spanning July 2 – 4, though I guess it’s only fitting that the film concerns itself only with the American side of the conflict, and if we had gone global, I guess then the filmmakers wouldn’t have been as justified in delivering to us that wonderfully cheesy and jingoistic scene where the President of the United States declares that July 4th is no longer an American holiday, but a day for the entire human race to declare its independence from extra terrestrial threat. Of course, this ends up being completely thanks to us Americans fixing the problem by ourselves, but it’s the thought that counts. Plus, how awesome are we? This will be his Gettysburg Address! 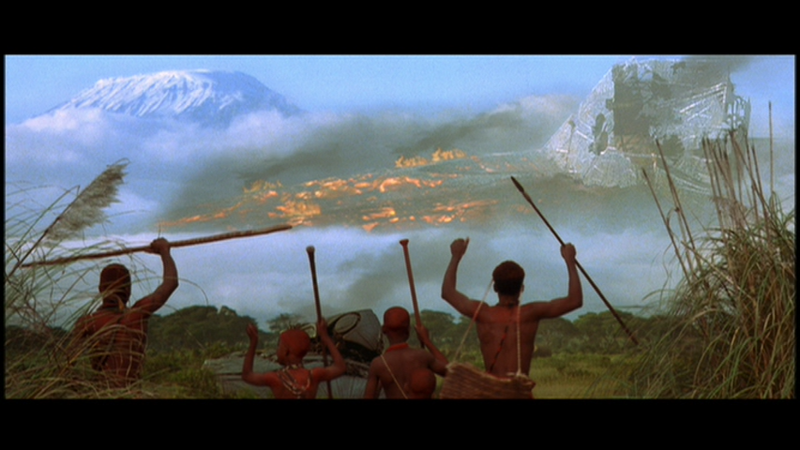 At the very least, the film attempts to reflect a melting pot of mostly entertaining stereotypes and even has some nice reaction shots of various people of various races and demographics staring up in unison (and fleeing in droves) as the alien ships arrive dramatically into our atmosphere. The film focuses on a rather large set of initially unrelated (but 100% American) characters that are united in the end by this common enemy. Here you have your paranoid Jewish nerd in Jeff Goldblum, his working-girl ex-wife he still pines for in Margaret Colin, the plain white but thoroughly plucky American President in Bill Pullman, his wife in peril in Mary McDonnell and their young daughter in tow in child actress Mae Whitman (Her? ), and then your African-American ace fighter pilot attempting to make a successful jump from TV to film in Will Smith (in his first summer blockbuster role that would spawn many others), and his stripper single mother girlfriend in Vivica A. Fox and her young son played by Will Smith’s cousin on said TV show, and then also Randy Quaid, who plays a drunken former pilot and possible alien abductee who seeks not only revenge against the aliens but reconciliation with his children. Oh and then… well, you know what? I’m just going to draw the line there. Those are at least the main characters — well, there’s also Judd Hirsch, too — but there are several other “Hey look!” moments throughout the film. Let me just say that, unlike with his other films afterward, Emmerich does an admirable job here juggling this huge cast amidst all the crazy action and dialogue, and they all get their little moments to shine, with none of them feeling like they were given too much or too little to do. As for the dialogue they’re given, it really is all pretty preposterous. This is the kind of film where you could get pretty smashed if you were to take a shot every time a character speaks an over-familiar line stated in countless other films, but within ID4 (its official but equally silly abbreviation), it’s almost endearing — this before irony was really even in vogue. Take, for instance, the first time the fighter pilots engage the alien ships — by the time the scene is only one third of the way through, you’ll have already heard the lines “Lock and load,” “Get them outta there!”,” There are too many of them!”, and “I can’t shake ’em!” shouted out by various characters as the camera cuts between the doomed pilots taking on the alien spacecraft while the elected government officials and military leaders scattering about frantically in some remote location while staring at various radars and screens that are counting down the number of fighter pilots left surviving in the battle. 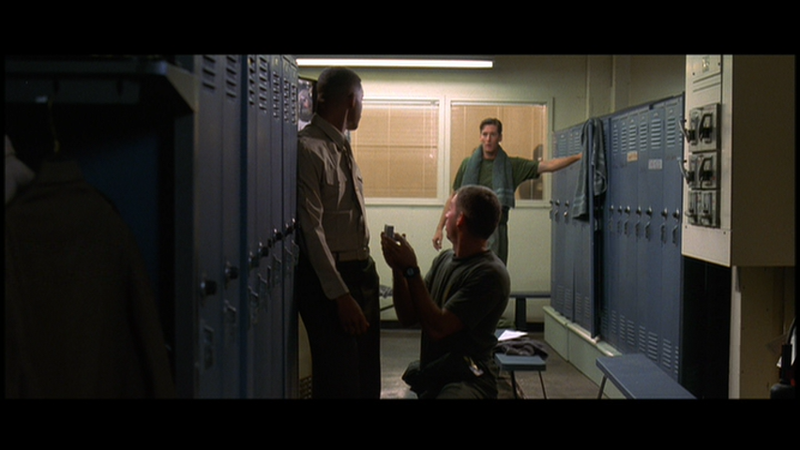 The scene plays out like a mix of the Death Star attack with Top Gun, complete with a character whose Goose, so to speak, was already in the oven the minute he appeared on screen. You also get an especially ridiculous scene where it turns out that the government has apparently been keeping Area 51 such a closely guarded secret that not even the President has the knowledge of its existence. (“Two words: Plausible deniability,” it’s explained.) Yes, it’s one of those movies that plays into the familiar conspiracy theories and pretends like the government was idiotic enough to deny the existence of a place that quite clearly, obviously, actually existed on top of the whole Roswell thing, but I actually love ID4for all this because it just adds onto that incredible preposterousness at which it excels. “There is no Area 51,” the President ignorantly declares,” before the awkward pause before the confession. “…Sir, that’s not entirely accurate,” the shifty Secretary of Defense admits. The scene where the President is finally introduced to the mysterious air base by the Secretary is played out like a kid who has confessed to their parent that they’ve been keeping a puppy hidden in their closet for the past few days and have also been feeding it their broccoli, too. Like I said, it’s so stupid and yet so entertaining — how could you not love this film?! But let’s not forget genuinely good stuff, either. 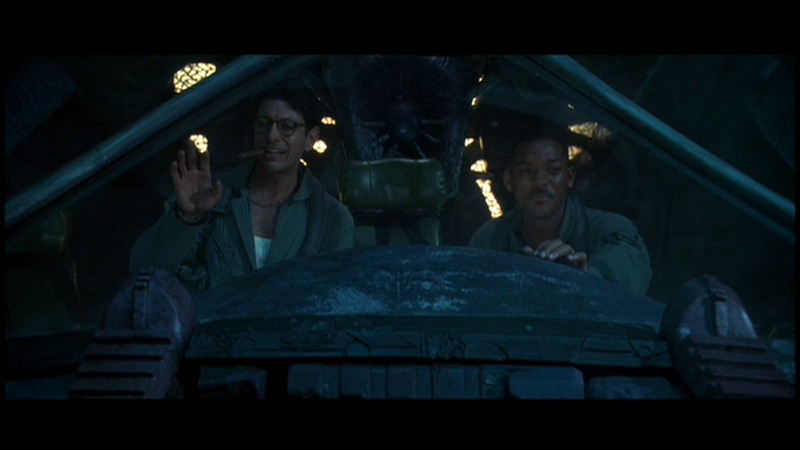 In his first major starring film role, Will Smith is great as a wisecracking fighter pilot, and once they’re together, he also has great chemistry with Jeff Goldblum, who is in his usual paranoid mode as the necessary computer nerd who saw it all coming and somehow figures out a way to use his Apple laptop to take down the aliens. And the alien designs, by the way, are a nice mixture of classic big-eyed alien design and more modern, sleeker sensibilities. The autopsy scene is both chilling and fascinating, and the practical effects on display are masterful in making the alien individuals feel like a real threat, while the imposing alien ships are equally scary in both design and function. The sense of scale on these giant ships is breathtaking! The film’s centerpiece of the aliens’ primary weapons being detonated over major landmarks is exhilarating in scope and execution, even with the dated effects showing their age. The final dogfight is also quite exciting and, corny as it may be, the scene where a certain underdog saves the day manages to be adequately touching, and the oft maligned solution to taking down the alien threat, a technological update to the War of the Worlds solution, has actually aged into being endearingly naive. This is the closest you’ll get to seeing the global affects of the invasion. DISCLAIMER: I have nothing against countries other than America, except the ones who I would consider totalitarian (you know who you are…). Conversely, I also love America, despite its flaws, and so … well basically I’m saying that any political meaning that you may be deriving from any portion of that last paragraph or anywhere else in the review, I guess, is purely your own manifestation and not my own! I also have nothing against Good Night, and Good Luck, and it has honestly been so long since I last saw it that I can’t honestly pass judgment on it. Either way, it was totally a joke. The only thing that wasn’t a joke is the whole Martina McBride thing — it really bugs me when they play a song about spousal abuse as if it was a song about the awesomeness of America. LISTEN TO THE LYRICS, PEOPLE!